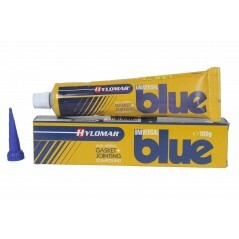 Hylomar Universal Blue is the oldest and most popular of the Hylomar series of sealants. Hylomar Universal Blue was originally developed in the 1960's by Rolls-Royce Plc to help seal against synthetic lubricants that were used in early jet engines. Yeas ago this original Hylomar formula was commonly known as either PL32 L, M or H (Light, Medium or Heavy grade). Some users were also familiar with the older Rolls-Royce internal part number of SQ32. However, per various changes in the Rolls-Royce requirements, the PL32 designation was removed in the mid 1990's and the product was renamed to "Universal Blue". The PL32 designation is now associated with the newer "Aerograde PL32M" or "Aerograde Ultra PL32A" formulations.